Collector car auctioneers Mecum Auctions will host the 27th annual Original Spring Classic early next month, a 5 day-long event which will see a slew of ultra-desirable automobiles go under the gavel. Among them will be this, a fully restored, extremely rare 1968 Pontiac Firebird Ram Air II. According to Mecum, this Firebird Ram Air is one of only 110 built, and one of only 98 built with the M21 close-ratio 4-speed manual transmission. It is a full, frame-off restored example which has accumulated only 62,000 miles since it left the factory in ’68, and only 500 miles since the restoration was complete in 2004. It is using the original L67 Ram Air II 400 cubic inch V8 engine which has been fully rebuilt, but still maintains the correct 10.75 compression ratio and original camshaft and valve train specifications. The seller estimates it is producing around 430 to 440 horsepower. The Firebird, which is on its third owner, was featured in the September 2004 issue of Muscle Car Enthusiast and the June 2008 issue of Muscle Car Review. It is backed by extensive PHS and factory documentation which includes owner history, factory bulletins and price schedules, factory order and billing history sheets, copies of magazine articles including a May 1968 Super Stock and Drag Illustrated Magazine technical analysis and a copy of the factory Ram Air Installation Guide. If you’re interested, the Firebird is expected to cross the auction block at the Original Spring Classic in Indiana on Saturday May 17th, 2014. For more photos and information, check out Mecum’s ad for the car on their website. My Manager at work has one of these and I think his has less than 10,000 miles. It was a drag car only and parked for years. It is fully restored and took Gold at POCI. It is in a Museum on loan right now. He restored it right down to the correct code wheels etc. I went over the car looking for flaws and only found on. It was fixed and it is one of the best cars of this era I have ever judged. It was on the cover of High Performance Pontiac a year or so ago when the POCI was in WV. It is that red with a orange tint. He was lucky as most of the parts that were removed in racing were saved. It still has the stock factory interior that is like new. 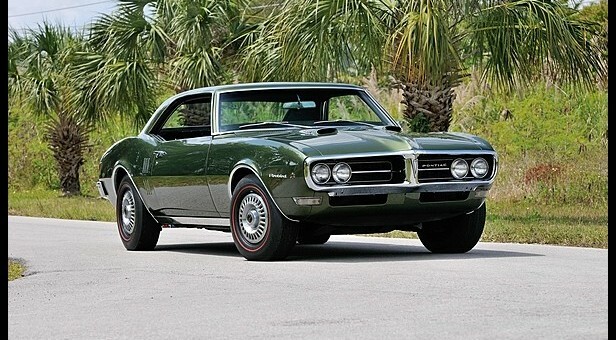 The 1st Gen. Firebird is one of the most underrated and underestimated original American pony cars out there. It’s been completely overshadowed by the Camaro. You sure as heck don’t see a lot of these – either on the street or at auction. Frankly, it’s as aesthetically pleasing as its 1st Gen. Camaro sibling, if not more so, IMO. Great car! The key here was even with the shared body parts the suspension was not the same, the engine was not the same and they did hide the Camaro fenders and other parts pretty well. Back then you really got more for your Pontiac money than just some styling changes only. So many miss that Pontiac made these cars one inch lower new. Too many restore them and set them up higher.